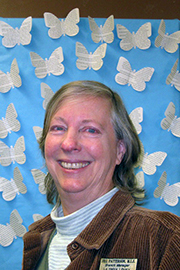 In the library field for over 40 years, Jill Patterson has worked for private, public, special, and school libraries. She is a judge for several national and regional book awards. A science fiction and fantasy fan, she has spoken at Comic-Con on graphic novels and their place in the library. Patterson credits her parents for her love of reading through reading aloud to her, weekly trips to the library, and filling their house with books. Belonging to two book discussion groups ensures that she reads widely in all areas.